In the winter months, I develop a deep appreciation for my crock-pot. Not only is it convenient, but its ability to produce large amounts of comfort meals in one shot is ideal on a long, chilly day. Although I’ve attempted several different chili recipes in my slow cooker, this one bar far, stands out among the rest. The sweet potato and black bean combination is a beautiful marriage of ingredients, while both of these elements provide significant nutrition including fiber, protein, vitamins and iron just to name a few. But what makes this particular chili unique is the surprisingly succulent bite of chocolate. One wouldn’t normally think of adding a sweet touch to a savory stew, but a dash of carob powder pulls out a multitude of exceptional flavors. Prepare the ingredients ahead of time, throw them in your crock-pot, and come home to a warm, hearty chili at the end of a long day. The leftovers will last for up to two weeks in the refrigerator, or you can also freeze them for a much longer shelf life. In a 4 to 6-quart slow cooker, combine the onion, bell pepper, garlic, chili powder, cumin, cocoa, cinnamon, 1 teaspoon salt, and ¼ teaspoon black pepper. Add the tomatoes (and their liquid), beans, sweet potato, and vegetable broth. For the past several months, I’ve stared casually into a pantry filled with canned soups. The thought of warm liquid filling my belly in the heat of summer was never appealing, nor was the idea of heating up broth from an aluminum can. It isn’t until the weather becomes chilled do I crave a hearty bowl of soup for dinner. This past weekend, I realized that it is officially soup season when I was forced to turn on my heat with near freezing temperatures in the morning. Soup and I have a love hate relationship. I love it for many reasons such as it’s convenience, it’s ability to produce delicious leftovers and the fact that I can usually add a plethora of ingredients and still produce something scrumptious. I don’t love the fact that it normally takes all day to cook and should be planned ahead of time in order to gain the most rich and rustic flavors. When I do think to plan ahead, preparing soup in the slow cooker is a guaranteed delectable meal. 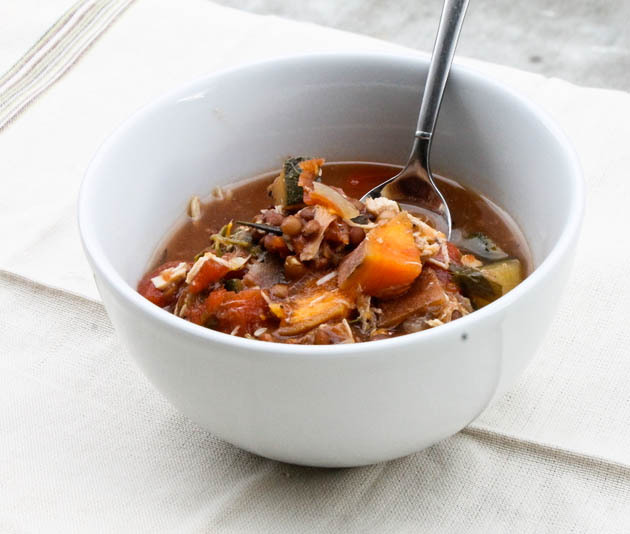 This filling recipe combines seasonal root vegetables and nutritious lentils for a comforting stew that warms the core on those cold fall nights. I added chicken for a bit more protein boost but you can leave it out if you are looking for a meat free option. In a 4-quart slow cooker, mix onion, zucchini, squash, lentils, broth salt and pepper. Add chicken. Remove chicken from slow cooker. Use 2 forks to shred the chicken and return to slow cooker. Stir in tomatoes. Cover and cook on low setting for 15 minutes or until thoroughly heated.